Thank you so much for all you kind notes on social media, your comments and requests in regards to more ideas and maybe with a background and so on. 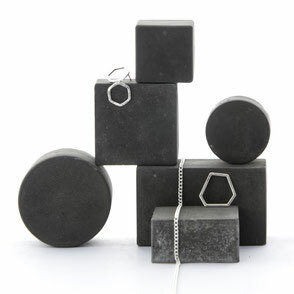 Here we go, your wish was my exciting command and I photographed my latest batch of modular geometric concrete blocks in multiple ways to inspire. 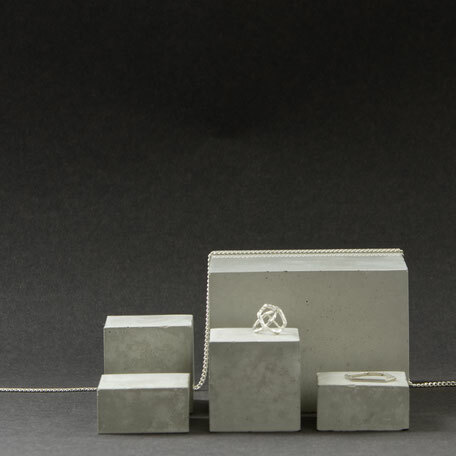 Well, I think the basics with a white background and using some simple other props to style your designs are covered in this post - Geometric Concrete Photography Props and Jewellery Styling Inspiration and even more can you find over here! But enough let's get right to it, shall we?! On the left I used recycled grey/brown paper. 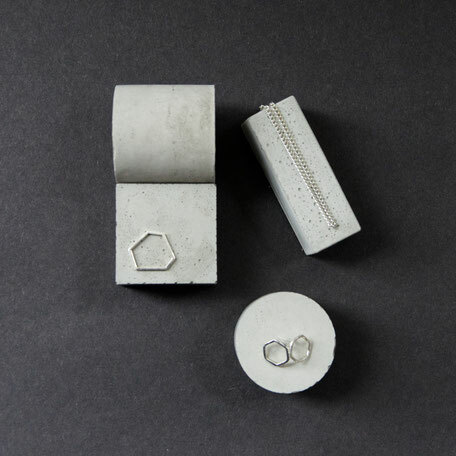 But it was a bit dull so I crunched it a bit to add a bit of depth and allow the concrete solids to carry smoother textures all the way to the shiny jewellery. Below, I used a dark grey paper for the background. It is an A2 size sheet and hung without hard fold. 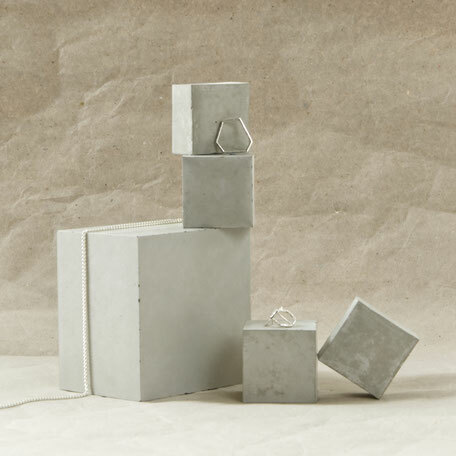 I then added the concrete blocks and stacked them in a playful way before adding jewellery or cosmetics/nail polish. I always allow for a bit of space to show the whole set however, to showcase just the one bottle or just the earrings you of course zoom in or crop later but for editorial shots this looks about right to inspire. Moving on with the dark background but doing a flat-lay on the left and an image with great depth to the right focussing on the jewellery in the middle - centre stage if you like. Both angles illustrate how a customer would most likely see your designs at a market stand or retail display in a jewellery shop. Since this is the case this is a simple and effective way to promote just your designs. 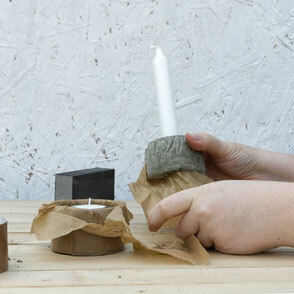 It is the time to cozy up and some of you noted that they are looking to display on a natural while modern edgy look. So here is my first take, if you like, of the season. I chose brown wrapping paper here, I am not really keen on those lines in the paper but I did not any brown paper without it at hand. 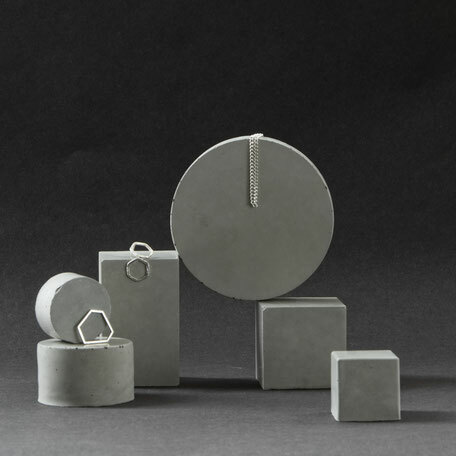 Geometric Concrete Jewellery Display Block Set of 6, No69 - same set as above but what a difference! The flat-lay on the left has a large sheet of crushed/wrinkled brown paper as a base. 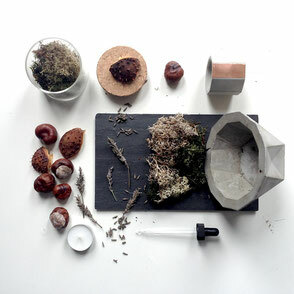 From there I added the concrete solids and after that a mix of moss flakes. 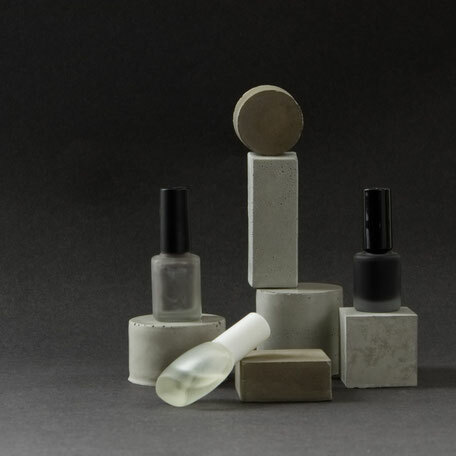 One cup of moss flakes was enough to create a display with these six sculpture solids. And of course, lastly, the jewellery was added. 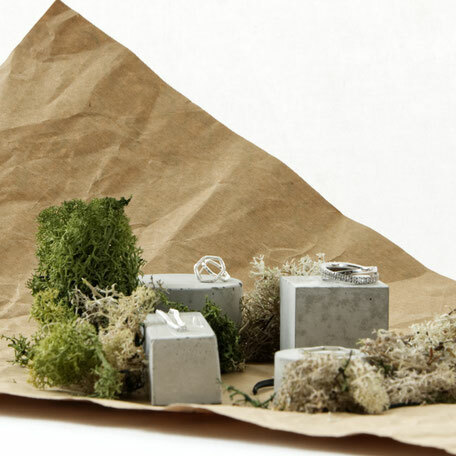 Just a little note, look how different one and the same set can appear - above on a dark background and here with moss. The right side has a bit more going on. The sheet is smaller, wrinkled but styled for depth of the photograph or for a plinth display. The sheet is set up to appear floating, just to be anchored down by the weight of the concrete. I added a dark green Reindeer Moss tree to have the natural element be the tallest object. 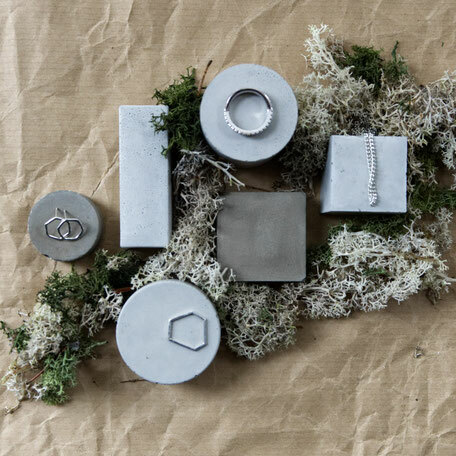 From there it goes right to the jewellery, followed by the smooth concrete and finished with, or the circle is closed by, a mix of moss flakes. Well, I hope you enjoyed this little post and feel inspired for your display. There is always more to come so feel invited to follow and of course to browse my blog sections above. Looking forward to see what you come up with #pasinga!